It’s been a difficult week, but whenever I do this to myself, when I put myself in a position where I have to deliver on something that I am honestly not sure I can do successfully and I get very stressed and start to wonder what I was thinking in the first place, I also think, this is just 6 weeks of my life and the experience I have during this time, whether it is good or bad, will last a lifetime and teach me more in just 6 weeks than I would ever learn in 6 months doing my usual bumbling around. I had my workshop last weekend and it went well. 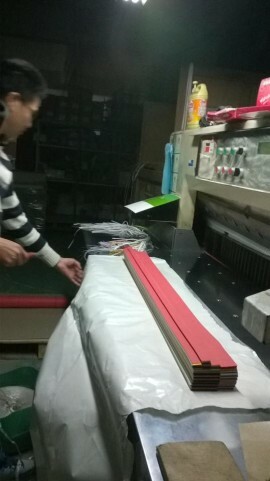 The day before, Chen Wei and I went to his friend’s printing factory to get the coloured paper that we had bought cut into strips using his huge guillotine. 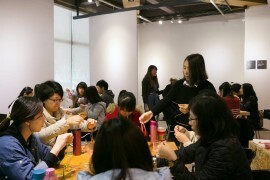 The participants at the workshop were, as expected, very quick when it came to learning all the quilling techniques that I taught them in the morning. In the afternoon I was both pleased and disappointed. Pleased because everyone immediately got into using the really big quilling strips and were not afraid to make something big and abstract, but a bit disappointed as not many made jewellery or very small things and they didn’t really try to think about how they could use quilling to make other objects from daily life. I could tell they were all enjoying themselves though, and apart from being relieved about that, they did make some interesting things. One girl did make a pot and it was really good, better than the example I made I think. Zhi Fei told me that this girl was a designer and I’m not surprised. On Monday I phaffed about and began to build my wall installation, using the quillings that the students made in the workshop. I didn’t make much progress, I didn’t like the design I was creating on the wall much and I started to get stressed. On Monday night I had bad dreams. On Tuesday morning I had my Mandarin class and it takes an hour to get there and an hour to get back as well, so I could have done without it a bit. I continued with the wall installation and it got a little bit better, but I still wasn’t happy. On Tuesday night it started raining heavily and it didn’t stop. On Wednesday morning the water had come through the windows in the kitchen, which are not sealed properly and there was a mini flood on the kitchen floor. It hadn’t stopped raining. My shoes have holes in them (I am hoping Andy will buy me some new ones for Christmas) so I had wet feet all day. I brought dry socks to C Platform because I knew it was going to happen. I made some animations with some of the small quilling produced in the workshop and continued building my wall art, which was still driving me crackers because it was just not right. At about 6pm I was still at C Platform with Chen Wei and there was a call from Aaf to say that the electricity in the flat was off. We decided to eat at C Platform and go home even later as there wasn’t much point in me going home to sit in the dark anyway. When we got home I went to Chen Wei’s to use the internet and drink some tea before going back to my flat. Aaf went to stay with her friend (I didn’t blame her). It was still raining just as heavily as when the rain began. The rain was starting to stress me out as much as the wall art. I’ve never experienced such relentless heavy rain before. When I got home there was a man at my door who tried to speak to me but I didn’t understand him, I called Chen Wei who came round. The man was from the next door apartment. The other apartments on my floor also had floods and broken electricity. We all have the same landlord who wasn’t even in Xiamen and clearly not bothered. The man wanted to try to turn the electricity back on but he wanted us to take all the plugs out of the sockets first in case something was not right. The electricity was back on! So I was able to get on top of the new flood in the kitchen before I went to bed and prepare for a night of more rain. The electricity went off again about 3 hours later. When I woke up the next morning it was sunny. I cleaned up the kitchen for the last time. It doesn’t usually rain like that this time of year. On Thursday Yi (one of the C Platform designers) photographed people wearing the jewellery that had now been made by some of the other C Platform designers and by me previously. I continued with my wall installation but after all the electricity and flood problems I was beginning to take everything a bit less seriously. 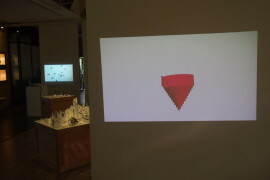 Chen Wei and I worked out where all the display plinths and other things would go and it felt a bit better. I had to go to my Mandarin class in the afternoon and I had arranged to meet with May and Weina after that. I felt I should have stayed at C Platform but I really needed the break. 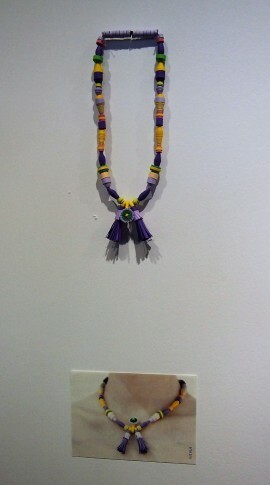 I left Chen Wei and the other staff hanging up the jewellery on the walls. It was such a relief to meet with Weina and May. I really needed to talk with some good friends and we had a really lovely time. Last year we all went to a cat café and May knew about another one called ‘Baby Cat’ in her neighbourhood. It has a sister café on Gulangyu that has this massive cat, which was a bit of a local legend. It turned out, however that the new ‘Baby Cat’ cafe only sold biscuits. We went for something to eat instead and then to another coffee shop. There are loads and loads of really cool coffee shops in May’s neighbourhood. The one we went to sold ‘Tea Pigs’ tea (the small ethical company) and it had completely stolen the name and brand for the whole café. I wonder if Tea Pigs know, or if they care, or if they would be able to do anything about it anyway. 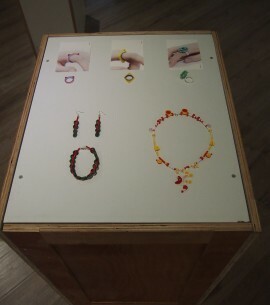 Last year Weina was making a book as an art project which showed images and told stories about couples. She interviewed Andy and me and took our photo for the book. She also spoke to young Chinese couples on the street, asking them questions about how they got together and what the think about marriage etc. The book is called ‘Tell me what Love is’. Weina brought the book for me to have a look at. It is really interesting, I was completely hooked on reading the Chinese stories. I actually forgot to read what she wrote about Andy and me! I have since bought a copy from her, at cost price as actually she’s not selling them, she only has one copy and she is getting mine printed before I leave. 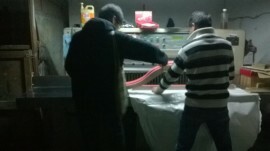 I had a call from Chen Wei in the evening to say that someone was going round to fix the electricity. When I got home it was working! When I woke up in the morning it was off again. My fringe goes a bit funny when I don’t have use of a hairdryer. 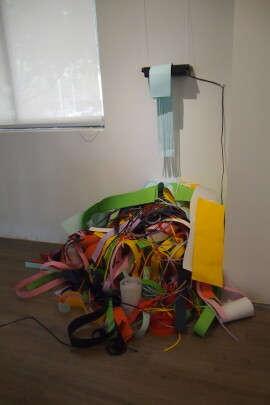 I went to C Platform and saw that Chen Wei had hung the jewellery and assembled a corner of the gallery with a shredding machine that shredded strips into a pile on the floor. It was really good! 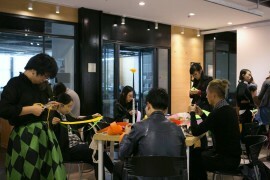 Six students from the university on ZhanZhou, who I had taught quillng last year turned up and I got them making experimental work on paper with ink using quilling techniques and some more jewellery. They made some really good stuff and along with some lovely quilled numbers that Yi made, it plugged the gap from the work that wasn’t made in the workshop. 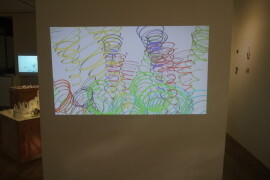 I finished my wall installation and was finally happy with it. It helped also, speaking to Aaf the night before, when I told her it was difficult because I was not using my own quilling for the installation, rather the quilling of all of the participants from the workshop, so the design was not really as I would have had it if it had been me making the quilling. She suggested I make it clear to the exhibition visitors, so I wrote something to go with the wall and also the animations that I made, along with an exhibition introduction for the exhibition entrance. By early afternoon on Friday I was finished. 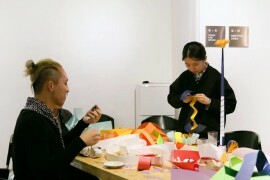 Chen Wei had put up the photographs of people wearing the jewellery and another of his designers had made this fantastic animation for us to show, which was inspired by quilling and looked like it was made from paper strips. Two of the students spent all day finishing their quillings for the exhibition. 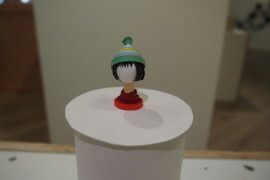 One made a really beautiful necklace and another quilled a head of a girl that looked just like her, wearing the same bobble hat that she was wearing herself. We had commented that the way it was knitted looked like it was quilled. They were still there chatting with Chen Wei when I left at 6pm, completely stress free by then and unable to remember how anxious I had felt before the exhibition had started to come together. I walked home with Zhi Fei, who I have really not mentioned enough considering she has been such a good friend to me and made a great impression on me for all sorts of reasons, not always right to write about on my blog. When I got home there was no electricity again but I didn’t care too much as I felt so happy that everything was finished and I was happy with it. I went for Shau Kau (BBQ) on the street which is so good! You pick the foodyou want, which is stuck on wooden sticks and put it into a basket and then had it over and they BBQ it and bring you each stick as it is ready, cooked with nice spicy stuff. I then went to a lovely coffee shop to use the internet. Chen Wei came round once I was back, to give Aaf and me some battery powered lamps that he had charged and hot water that he had boiled. In the morning the electricity was fixed for good. 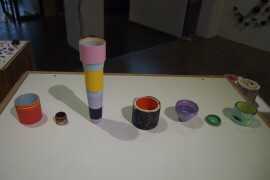 Here is my exhibition intro and the pictures. Quilling is the art of rolling and manipulating narrow strips of paper to create beautiful designs. This historic craft was first known to be practiced by catholic nuns in Europe in the 17th century and it is now enjoying a modern revival. Josie Jenkins is an artist based in Liverpool, UK, whose focus is to pass on the heritage of quilling and also to inspire modern uses for this versatile paper craft. 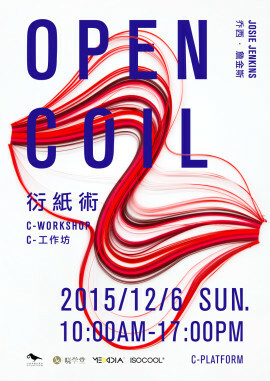 The Open Coil workshop at C Platform provided a masterclass in traditional quilling techniques and then challenged the participants to consider how these skills could be used to create experimental artworks and 3D design. 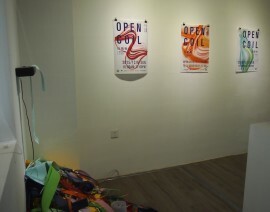 This exhibition features work made by the participants of the workshop. 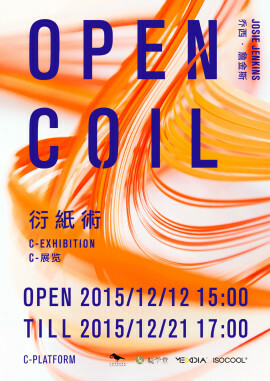 The ‘Open Coil’ exhibition begins to explore how the historical craft of quilling can be used to create contemporary art and design and provides visitors the opportunity to participate in creating their own ideas. 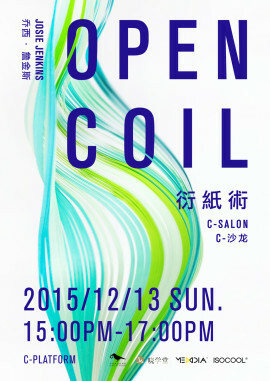 Tomorrow is the Open Coil Salon at the local bookshop. Apparently there are a lot of people booked onto it. We’re going to make a simple quilled bookmark after I talk. Yuping is interpreting for me. I have been trying to explain what a ‘coat of arms’ is. 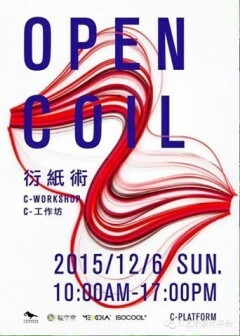 Finally the workshop, talk and exhibition details are agreed! It’s been a bit of a long process but understandable, firstly due to the way things work in China and secondly due to C Platform (and me) wanting to get the best possibly outcome with the time and other constraints that we have. So first we do the C interview. Chen Wei sent me some questions to answer, which were then edited and sent out as an interview via WeChat. It’s just in Chinese at the moment and not yet on the website as everything happens on WeChat in China, it is the most important form of communication and the website is secondary, just for show really. I even noticed yesterday, that there are no telephones in the C Platform office. Zhi Fei and Chen Wei use their mobiles sometimes but this seems to be for informal calls. The C Interview gives the public an introduction to me and what they might expect from my workshop, talk and exhibition. Below is the unedited version that I sent to Chen Wei. I think the final one uses the questions I answered to write about me in the third person. Can you introduce yourself and your works. I live and work in Liverpool, UK, as a quiller and a fine artist. As a fine artist, I work mainly with painting and drawing, exhibiting and teaching. I also work as a director of my studio group, Arena, but I do this on a voluntary basis. 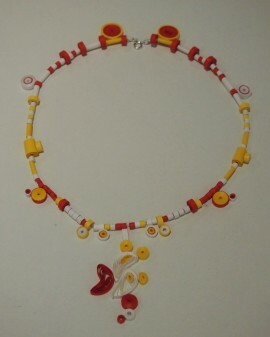 I do not sell my quilling work, as my main interest is to pass on the heritage of quilling and use it to inspire people. 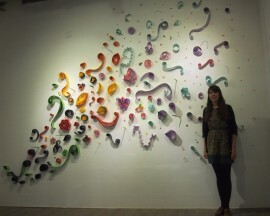 I keep all of the quilled pieces that I make and instead, I use them for displays, when I am demonstrating and teaching. I present talks and demonstrations and teach classes and workshops for beginners and advanced quillers to galleries, museums and to local groups. I do not remember a time when quilling was not a part of my life. My parents started a business selling quilling supplies around the time that I was born and they were founder members of the ‘Quilling Guild’. I have been a member of the Quilling Guild’s committee since 2008, and now I am in the position of Chair Person. 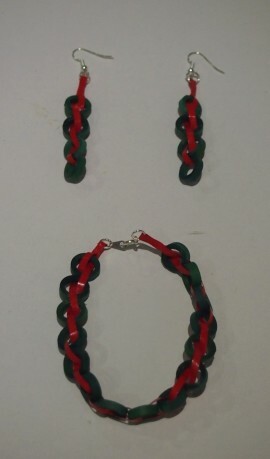 My work for the Quilling Guild is also on a voluntary basis. In 2014 I was awarded a Fellowship by the Quilling Guild. I always wanted to be a painter and I studied for my degree in Fine Art (painting) at Norwich School of Art, graduating in 2002. My paintings explore the way we shape the landscape that we live in. I take inspiration from the subtle incongruity between the natural and the unnatural elements, as well as the more noticeable order and disorder found in our modern landscape. My paintings often include ambiguous elements, or images from different sources, assembled like a collage. This not only emphasises the physically confused spaces which I find so intriguing, but also the confusion that I feel when I question the landscape’s beauty and the ethical responsibility of mankind, who is forever manipulating it. In 2013 I won the Valeria Sykes award for a painting called ‘Geograph Collage with Paperclips’ which had been selected for the New Lights Art Prize Exhibition, showcasing young British artists from the north of England. The award gave me the funding to visit Xiamen for an artists residency in 2014. 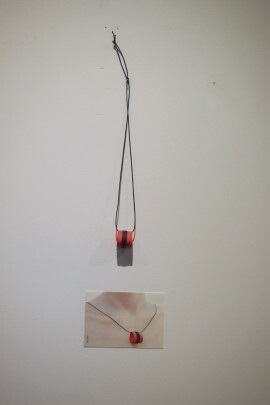 This opportunity had a huge impact on my artistic practice and of course the award raised my profile as an artist. 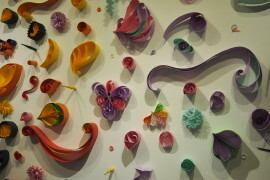 As an artist and quilling designer, how do you understand paper as media in your art work and quilling? Paper is a wonderful invention. It is no wonder that artists like to use it for both 2D and 3D work. It is incredibly versatile. As a quiller I am only concerned with paper strips, which are rolled, looped and manipulated. My focus has never been on paper folding, modelling, sculpting etc. It takes time to learn how paper behaves. When I teach my students I describe paper as ‘having a memory.’ By this I mean that when you manipulate it, it remembers what you did, and will stay in that position, more or less, depending on how long hold it there. 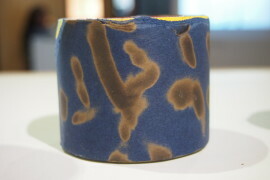 As you manipulate paper, you break down its fibres and so the paper changes. This has advantages and disadvantages, depending on what you are trying to make. The weight of the paper is also important and this relates to what you want to do with it and the size of the artwork that you are making. When I came to China last year I began to work with paper and ink and I have continued working with this medium since returning to the UK. It was only then that I started thinking about combining painting and quilling techniques. I had never found a way for the two to fit together until then. Painting on paper is a completely different experience from painting on canvas. 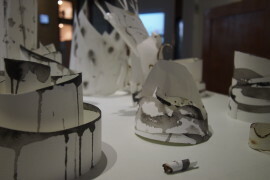 I feel like I am only just beginning to discover how paper behaves with paint and ink and I am now beginning to see how these techniques can be used, together with paper manipulation. Quilling, also known as ‘paper filigree’, is the art of rolling and manipulating narrow strips of paper and then shaping them to make the most exquisite designs. 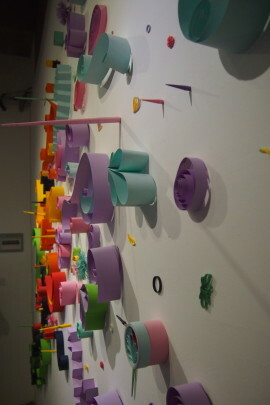 Projects can range from simple cards to pictures, jewellery, three-dimensional models or the decoration of boxes. Paper-rolling, paper-scrolling, filigree, mosaic and quilling are all names which have been given to this art during its long history. Examples of historic quilling can be found from the 16th and 17th Century (1500s and 1600s), when nuns on the continent were known to made reliquaries and holy pictures from quilling, adding gilding and much adornment. When gilded or silvered, it was difficult to distinguish it from real gold or silver filigree work. Qulling was then adopted by the upper class gentile ladies, who were known to make quilled pictures and cover tea caddies and furniture in quilling. Examples from the 17th and 18th century can be found in museums and galleries across the UK. In 1983 a group of quillers, who wanted to revive quilling and pass on its heritage, formed The Quilling Guild. The Quilling Guild is a charity which exists to encourage, support, preserve and publicise the art of Quilling. The work of the Quilling Guild includes a yearly convention with displays and competitions. There are now quilling organisations all over the world and the Quilling Guild has many members from countries including North America, Holland, Germany, UAE, Jordan, Japan, Brazil, India and Australia. 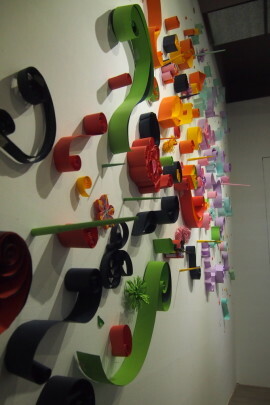 When you talk quilling, people think it is practical and decorative, do you think it can be related to contemporary art and design? In the past, Quilling has been used purely for decoration and is still considered a ‘handicraft’, a craft for people to do for pleasure or relaxation. Many handicrafts are quite repetitive and designs are often copied rather than new designs created. For quilling this can also be the case, but from history, right through to the present, there have been quillers who aspire to create elaborate works displaying highly developed skills and innovative designs. 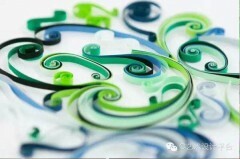 There are examples of contemporary designers making inspirational graphic work inspired by quilling. My favourite is Julia Brodskaya http://www.artyulia.com . 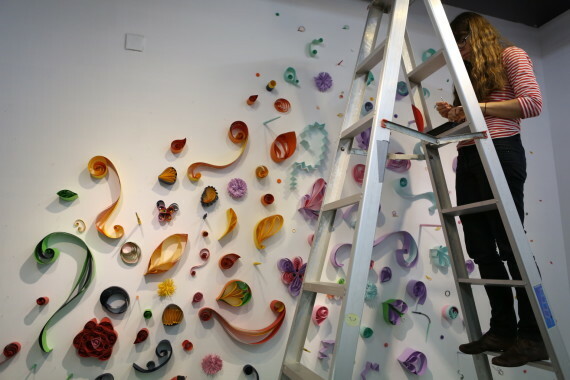 In terms of contemporary fine art, there are many examples of artists who have used quilling techniques to create artworks. Sometimes the boundaries between what is considered to be ‘craft’ and what is ‘fine art’ are blurred and for quilling this is no exception. 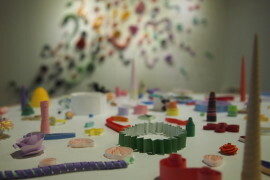 The idea of quilling as a ‘handicraft’ can hinder the viewer’s perception of it. Of course, whether an artwork is good or not is always a matter of opinion and a question of taste. Personally, when I look at fine art or craft, I am interested in the originality of the idea or design and the skill displayed in the use of the materials. 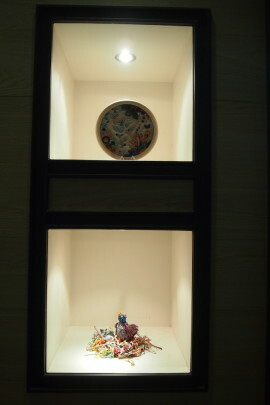 In many cases the amount of time it has taken to make an artwork is also a factor, but I believe very strongly that in contemporary art and design, the time taken to construct the art cannot stand alone as a factor for deciding how much value it has. In contemporary art and design, ideas, originality and refinement are everything. Although there are some incredible examples of artists who have taken inspiration from quilling techniques, I believe that the potential for creating artworks using quilling has still not yet been fully explored. On one hand this is a shame and on another it is incredibly exciting for artists and designers to consider. Could you brief us on what is your recent project? The focus of my work as a quiller is on the heritage of quilling, but at the same time pushing the boundaries to discover new ways of creating art and design using quilling techniques. My interest in the heritage of quilling is displayed in my commitment to using the traditional techniques that were used in historic quilling and in ensuring that the application of these techniques is of high quality, no matter what I make. My favourite quilllngs are the ones that surprise and intrigue the viewer. I have made a three dimensional bird from quilling and I always enjoy telling people that it is made completely of paper strips and glue, nothing else. Some people can’t seem to believe it. 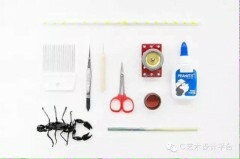 I also like the idea of making functional things from quilling. 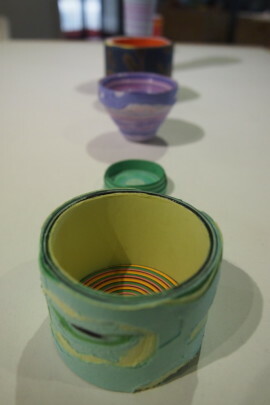 I have made jewellery, bowls and a lampshade for instance. I believe that people connect with functional objects in a different way form purely decorative items. More recently I’ve enjoyed the process of experimenting, more than making finished items. I believe that, if you want to really push the boundaries with a craft like quilling, then you must keep experimenting with it in different ways. Many of the things you try will not work out, but it will really pay off if you hit on a unique idea that no one has seen before. I can spend hours working on something that amounts to nothing, but something that I have discovered with art, is that you must take risks if you really want to achieve something. One great artwork is worth a million mediocre artworks. In my recent experimental work I have tried painting on large paper strips with ink and then rolling them in order to allow the painting to stand up of its own accord and sometimes become a three dimensional picture with layers created through the rolling of the paper. 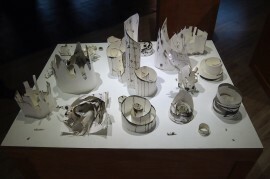 I have tried burning the paper and then rolling it and also modelling a bowl and then using sand paper to sculpt it. 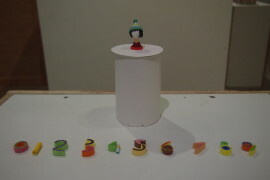 I have even made some stop motion animations with quilling. I also try experimenting with quilling techniques on a larger scale. I like the idea that everything I make has the potential to also be made much bigger, but working bigger has its constraints, as the paper weight must change in relation to how big you work, but then your hands may not be enough to manipulate it in the same way as when you work small. For the C Platform Exchange I want to deliver workshops that pass on the heritage or quilling and then give the participants the freedom to use the techniques they have learnt to try anything at all, within the boundaries of quilling. 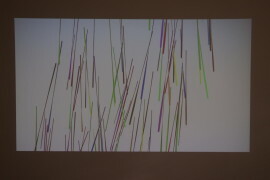 As with my own practice, these trails might not result in finished artworks or objects, but will inspire the participants to continue to experiment and develop their ideas after the workshop. Once you learn how to quill, all you need to be able to continue is paper and glue. 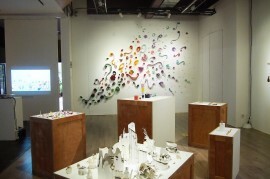 The work that is made in the workshops will be exhibited at C Platform as an installation. 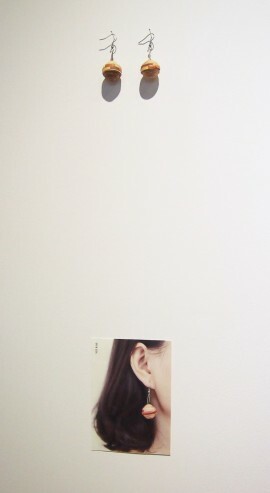 Before we sent out the C Interview, Chen Wei told me about a book shop nearby that might like to collaborate with us. He knows the owner, but has not done any collaborative working with them before. It turned out that when we launched the C Interview they contacted us, rather than the other way round. We went to visit the book shop, which is really beautiful, with a coffee shop and also arty books and gifts. The bookshop run workshops and present talks sometimes as well, relating to paper mainly I think. They came to meet with us yesterday and we agreed that we would do a talk there on Sunday 13th where we will also let the attendees have a little go at quilling, but they cannot do a workshop because there may be 60 (!!!!!) people coming to the talk. The bookshop also advertised the workshop that I am doing at C Platform, so this will bring new audiences and contacts to C Platform. Chen Wei feels it is important that C Platform are given recognition for talk I am providing at the bookshop and I agree with him. C Platform offer the public something for free but it is also a way strengthen their brand and important that they don’t miss the opportunity. Branding is in fact extremely important to C Platform and Chen Wei, something I am beginning to realise more and more. It is the Chinese way of course; the public face is so important. There was a lot of focus put on the poster design for my workshop. Yi, the C Platform designer who made it, spent a long time designing it and went through more than one design and a lot of alteration on this design, with instruction from Chen Wei, before it was finally finished last night. The workshop is on Sunday and I was worried that it would be too short notice, but it seems not for China, (a combination of everything happening last minute and there not being many opportunities for free workshops like this here) as we already had over 30 people wanting to book on and there are only 20 spaces. So here is the beautiful poster and some advertising images. C Platform always gets complimented on their posters and Chen Wei has very refined taste, which is reflected in the presentation of C Platform as a whole. Going back to the brand being so important, The workshop will last 1 day and 20 people will come, but the poster will last forever. 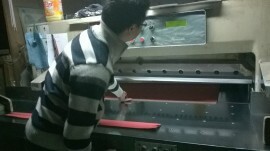 We visited a printing factory this week to see if they can help us with finding some big paper. Chen Wei knows the guy who owns it. It seems in China that business is never done straight forward on the phone, instead you go and see someone, you first have tea, and in Fujian province you have it Fujian style, sort of like a ritual; boil water in portable mini kettle, pour hot water in the cups to clean/warm them, throw away, pour hot water on the tea to clean it, throw away, pour more hot water on the tea to brew it, pour into tiny ceramic cups, sip the tea making slurping noises, have more tea, have more tea… It is a beautiful thing actually. Some people have a ceramic toy on their tea tray. The tray is there to catch all the water you keep chucking away. I think it was explained to me that if you pour water on the toy and the water evaporates then you know it is hot enough. 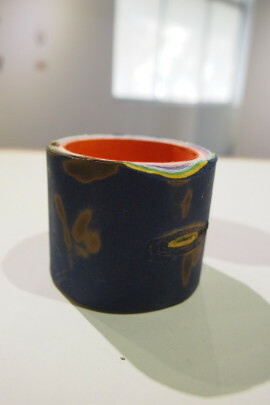 Chen Wei has one as part of his tea set which has glaze that will crack over time as you keep pouring the hot water on it. 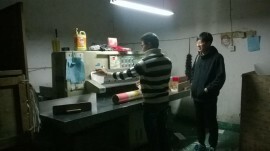 So we had tea and the two print factory men did not acknowledge me at all and neither did this happen the whole way through the visit. I never know if this is because China is a man’s world and I was not important or for some other reason, of which there could be plenty. There are some things I still need to understand. At the print factory they didn’t have any scrap paper that was any good but they did have a massive guillotine, more than double the size of the one my parents used to own. We have ordered some massive sheets of paper and they will be cut into really wide strips on the guillotine, to be used for the workshop.